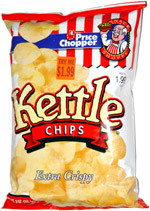 Taste test: These were excellent kettle chips, with a good mix of crunch and potato taste, without being too greasy. Not sure if they were actually "extra crispy" or not. There was enough salt, without being too salty. If you have a Price Chopper near you and you want the Cape Cod kettle chip experience at a lower price, grab a bag of these. Smell test: Smells like kettle chips. This snack was discovered by Keith at Price Chopper, Worcester, Massachusetts. Review published .